This is the last of the Procreation Sonnets. 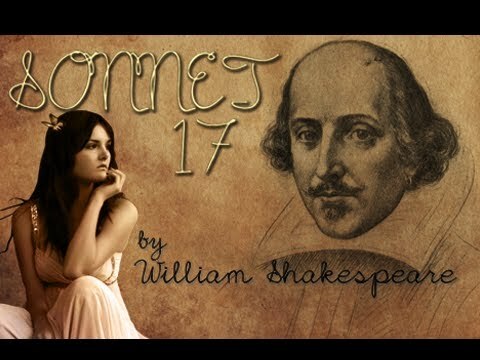 After a number of supposedly futile attempts to convince out-rightly the Fair Youth to bear offspring, Sonnet 17 paves way for a barrage of praise and flattery. Shakespeare also tries his hand at soothsaying with decidedly varied success. Yes there may be sceptics pertaining to the current descriptions of the Fair Youth and doubtless anything more would draw more disbelief but quite a number of us would probably have been willing to accept and appreciate whatever the persona deemed to be the true value of the Fair Youth. The Sonnet begins with a seemingly rhetorical question meant to in the original case entice the Youth into believing that whatever elucidations the persona mustered were but a shadow of what he really felt. A decidedly wise route to take seeing as any description could then not be criticized as bad whilst at the same time making the Youth feel a whole lot better about himself. Shakespeare's self criticism is so useful in that whenever one critiques oneself the people's expectations are lowered and whatever comes seems good enough. Likening his writing to a "tomb" heightens this self-criticism whilst also richly augmenting the beauty of the Fair Youth for if such flattery verse is but a tomb, only the wildest of imaginations can fathom what or whom the Fair Youth actually is. Repetition of the conjunction "if" to begin the second quatrain serves as a lamentation of sorts to properly express the dire regret Shakespeare feels at apparently not being able to capture the true beauty of the Fair Youth in writing. Some will say it is just continued adulation but even if only for a moment let us assume it is completely true. If the greatest writer of all time cannot in earnest do justice to the beauty of this creature then surely he must have been quite simply a sight for the sorest of eyes; never to be seen again unless he did have children. The third quatrain brings forth a rather sad feel to the Sonnet as the predictions within are so logical they have to be true. Instead of accepting the beauty of the Fair Youth and sharing it, we instead point to the quality and flamboyance of the persona. These Sonnets are "... termed a poet's rage" with the true memory of the Fair Youth embroidered only in mystery. Such is the importance of having children for an 'everlasting' legacy. None of us have Shakespeare to document our qualities so best we do our own documentation in whatever way possible. A Sonnet of great quality no doubt but more importantly a plea to all to find the best way to leave an everlasting memory.